San Luis Obispo County Sheriff’s deputies discovered a panga boat early Tuesday morning beached north of Piedras Blancas lighthouse outside of San Simeon. Around 4:15 a.m. deputies noticed an open gate to a field off Highway 1 and north of the lighthouse. When they arrived at the beach, they found the panga boat, as well as five men. The men fled by foot and the deputies chased, catching one after a scuffle, which slightly injured a deputy. A Coast Guard helicopter, a CHP plane and the Sheriff’s K9 unit joined in the search for the other four who fled south by foot. Authorities detained a second suspect about a mile away from the scene, but the remaining three escaped. The deputies did not discover any narcotics on the boat, nor did they press any narcotic related charges. But, the Sheriff’s Office says that the panga is consistent with narcotic smuggling operations. Deputies arrested Luis Osiel Gonzalez, 23, for felony obstruction of a peace officer and battery on a peace officer and Juan Pedro Gonzalez, 23, for giving false identification to an officer. Juan Pedro Gonzalez is currently on immigration hold. The boat is now in the possession of the Coast Guard. It is about 28 feet long with a single engine. Deputies also found approximately 30 cans of fuel floating in the water next to the boat. A lot of noise in the comments section about law enforcement resources and a small boat with pot. That’s a legalization argument, until such time; can you imagine what might have happened if a couple walking on the beach at odd hours had run into them? If you won’t consider that scenario; is the boat’s engine EPA compliant and do they have on-board waste storage facilities? There was no pot. And no, I cant imagine what may have happened if a couple, at 4:15 am in a remote stretch of beach had run in to ‘them’. Probably nothing. Not all boaters are violent. WHO GET GETS THE PANGAS? They are heavily laid up Fiberglas and almost bullet proof..
who get the 20K motors?? 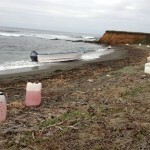 This panga was different than previous ones found in the area.This one had 30 containers full of gas. Why ? Was it going to make a return trip to mexico ? Or perhaps meet and re-fuel another panga offshore….continueing its way up the coast ? Perhaps meet up with a mothership to fill up with drugs and/or people. They had a hell of a lot of resources and people out there for a boat with gas tanks. Yeah, the CIA and the banksters are certainly not lacking in resources. Isn’t saying “panga boat” is kind of like saying “dingy boat,” or “tugboat boat” ? Wowsers! Deputies find a rowboat! Rowboat with a 350 HP outboard. Pangas aren’t normally rowed anyways.